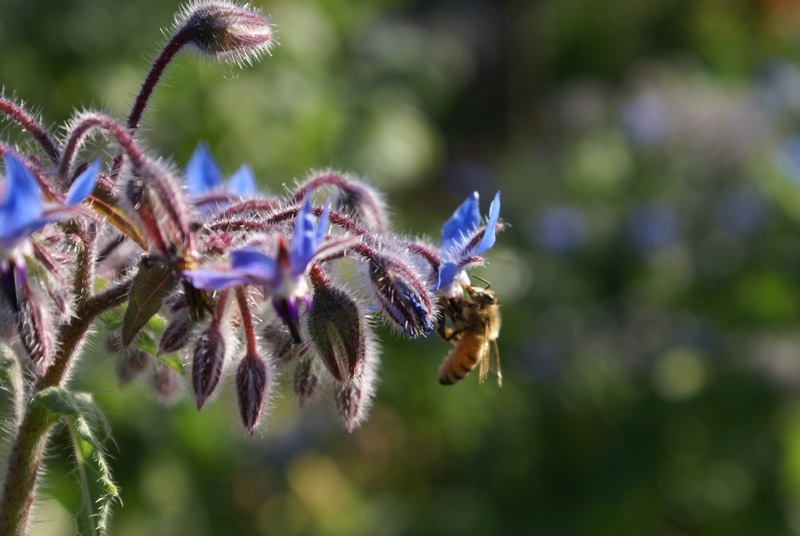 Local resilience: Current happenings in the garden – Earthlimited | Earth Limited? For some time I’ve been intending to write about happenings in our home garden. Climate change has never been an abstract issue for me. I have a long-standing interest in self-sufficiency, local adaptation and resilience. This goes back to my early 20s when I began consolidating my environmental interests and concerns. My first steps included becoming a vegetarian and developing a strong interest in organic agriculture. Both emerged in the latter stages of my first degree in horticultural science in the early 1980s. 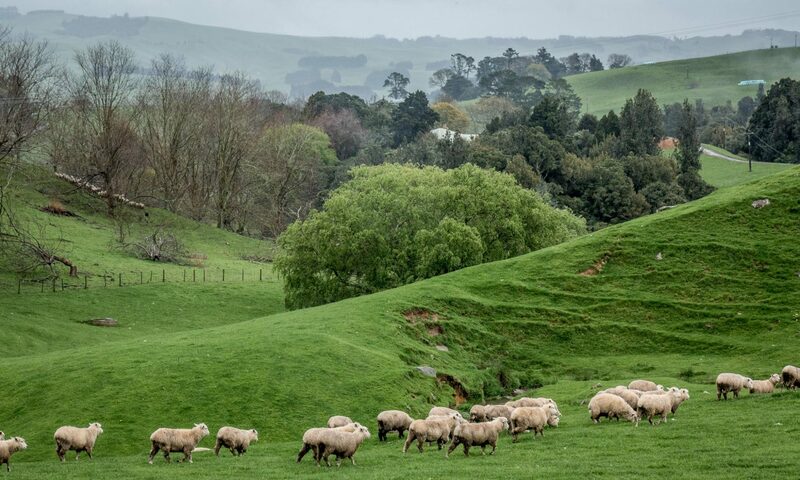 My first serious opportunity to start putting my ideas and interests into practice was during the 1990s when we owned a one hectare block of land on the slopes of Mount Pirongia. That’s something to write about another time. For now I thought it would be worthwhile to start talking about things that we do in our home and garden in Hastings. For the last ten years I’ve lived on a 1600 square metre section in suburban Hastings. Redesign of the garden and renovation of the house (built in 1959) are on-going projects. There are challenges with the garden, with an old stream bed running through the middle of it. This means very shallow, gravely, soil in the area immediately out from the back of the house. The grass inevitably dies off every summer and the garden needs regular watering, even with the mulching and composting that we do. I’ve learned to observe the progressive drying of the grass from the shallowest, stoniest, area towards the back of the garden where the soil is deeper. It gives me a good indicator of how dry conditions are as the summer progresses. In the worst year I’ve observed wilting in the leaves of some of the native trees at the very back of the garden. A Pittosporum tree died off that year. Currently we’re experiencing the height of spring. There is still moisture in the soil from a wet winter and everything is growing strongly. 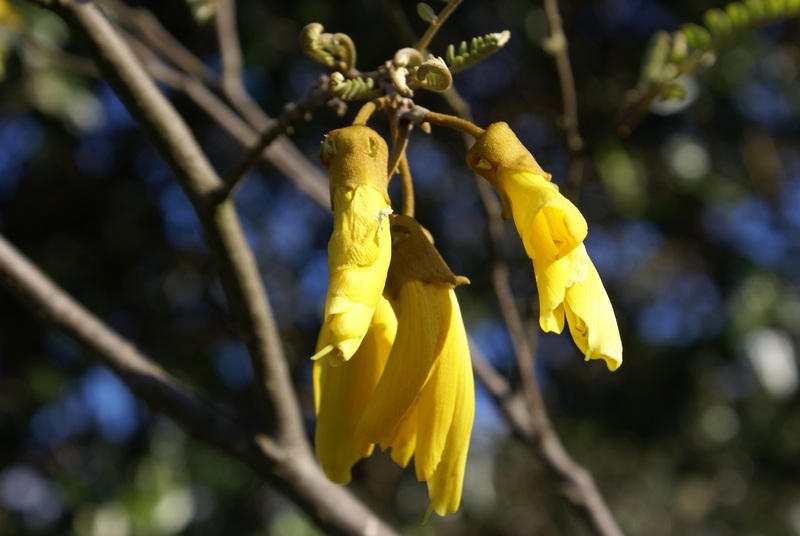 The native kowhai trees have already flowered and many are past their peak. 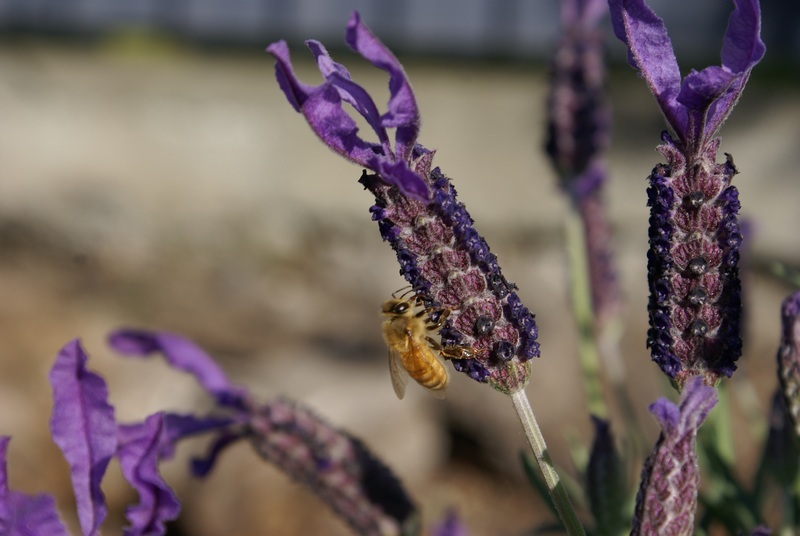 The lavender that I pruned back in the autumn has burst into life and together with the self-seeding borage is providing spring food for the bees. We don’t keep bees, but it’s something I’m very keen to do again. The garlic that we planted on the shortest day is now growing strongly. We harvested enough last year for our cooking needs and to supply us with seed for this year. For the first time, as far as I can recall, we still have surplus garlic in storage that isn’t going mouldy. We plaited it soon after the last harvest and it has stored very well. 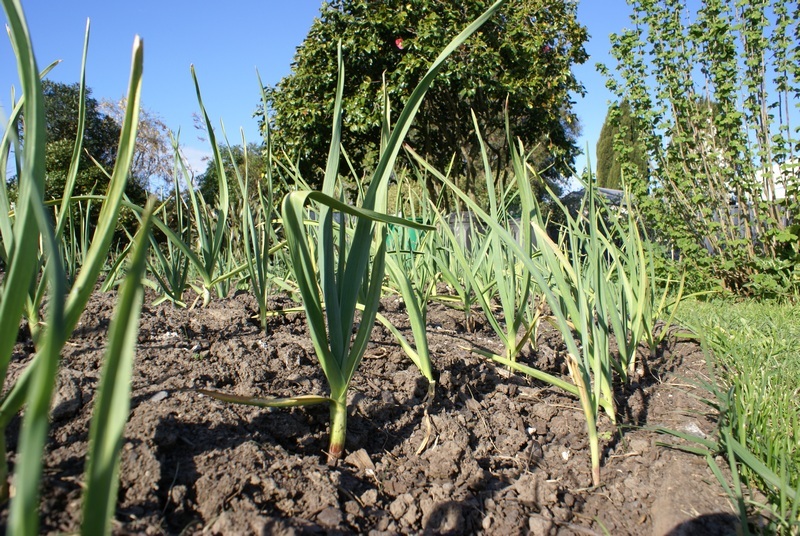 The garlic, planted on the shortest day, is growing strongly now. We’re looking forward to another abundant harvest. 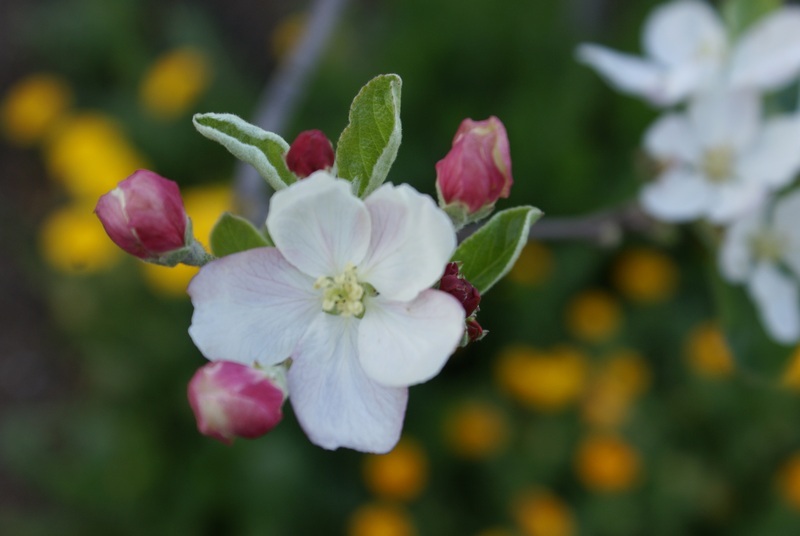 The solitary apple tree is in flower. The variety is called McMillan’s red. I got the bud wood from an apple grower on the outskirts of Hamilton in the mid 1990s. I used to always buy his apples on my way home from work. But he and other small apple orchards on the outskirts of Hamilton rapidly went out of business after the local market was deregulated in 1993. They were put out of business by the supermarkets which bought apples in bulk from large growers in Hawke’s Bay, dropped the prices, and very soon people stopped going to the local small growers. Even though he’d pulled his trees out the grower managed to locate some dormant graft wood for me. I then got some MM106 rootstock (a good medium sized apple rootstock, developed in England in the 1950s) from a local nurseryman and successfully grafted the McMillan’s red. Aside from the solitary apple tree other fruit trees we have in the garden are 27 olive trees (two Verdale and a Manzanilla, planted about seven years ago and nine Frantoio, ten Leccino and five Koroneiki planted just over two years ago), two NZ grapefruit trees, two tangelo trees, a mandarin tree, a lemon tree, four feijoas (two older trees, and two new varieties planted two years ago) a lemonade tree, a fig, a guava bush and a grapevine. We’ve been harvesting and processing fruit from the older olive trees for a few years now. We’re currently eating the grapefruit and have an abundance of lemons. 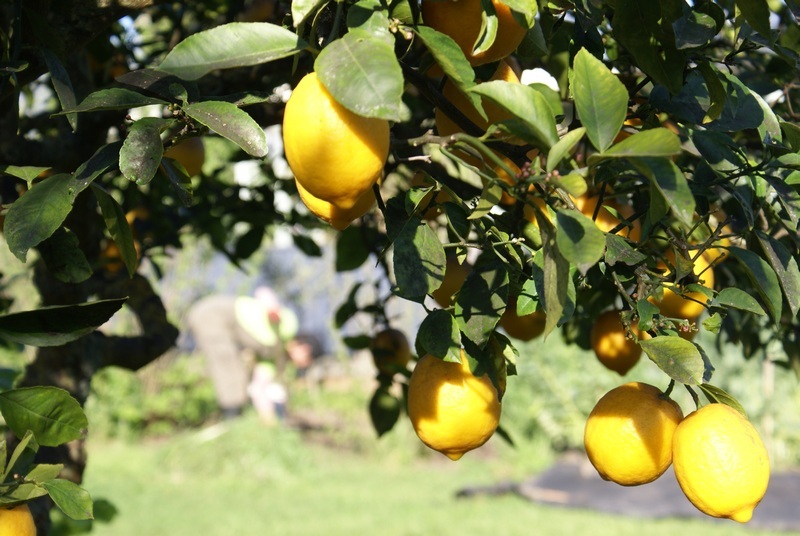 The lemon tree is in one of the drier parts of the garden and suffers disease problems as a result. We’re working to minimise the stress on these trees by building up the organic matter.